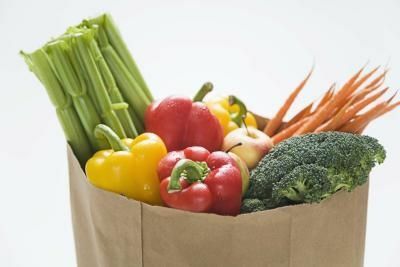 Mike Cannon brought an interesting article to my attention -- Study: Mediterranean Diet Can Save Money. I've heard people mention that they are spending more on groceries during our 30 Day Mediterranean Challenge. Most of the people that mentioned this seemed to be following the recipes in the Sonoma Diet book pretty closely. (If anyone has been keeping careful track during our challenge and you're willing to share what you've learned, please let me know.) Anyway, I was very encouraged to see this article. You can feed your family a Mediterranean diet on a budget. Dr. Mary Flynn, a research dietician, designed a meal plans consistent with most Mediterranean diet principles, but focused on using inexpensive ingredients to feed a family. Her recipes are all meat free and use ingredients that are available through most food pantries. It's clear she's striking a balance between health and affordability by building meals around pasta, rice and potatoes, but her plan steers clear of processed foods and incorporates plenty of affordable vegetables. You can learn more and see the recipes on Raising the Bar on Nutrition and check out the instructional videos on Common Sense Cooking. I also ran across 12 Ways to Stop Wasting Food on Whole Foods' website. They indicate that Americans waste up to 40% of their food. For a family of four, this amounts to approximately $2,275 of food waste annually. See the article for tips on curbing your food waste. Great share. Of course, we cannot disregard our budget, shall we say we should also prioritize it, we should also prepare for any emergency situation we may experience. What we can at least do is to choose the right and appropriate diet for us, a diet where we are comfortable and somehow could be easy for us.